Attention: Apex Legends is a Free2Play game, so the following are the different packages available for the game, like the founders package. To download Apex Legends, simply create an account at EA Origin and proceed with the download, as the base game is completely free. It's the latest release in the Battle Royale category, and it looks like it's facing the all-powerful Fortnite. 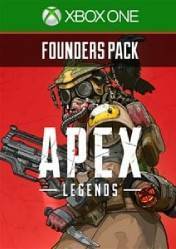 Remember that this version of Apex Legends Founders Pack is for Xbox One and contains the following extras: 2000 Apex Coins, for the purchase of all types of skins in the game store. An exclusive and legendary Skin called Demon Hemlok. 3 exclusive Roughneck Character Skins (1 for each class). 3 exclusive frames for banners (1 for each class). 1 Exclusive Founder's Badge. Remember that the Apex Coins is a game currency that can be used to purchase new personalization items for characters and weapons in the in-game store, and that we will use to purchase all types of cosmetics or to unlock new characters through the in-game store. There are no comments yet about Apex Legends Founders Pack . You can be the first one!